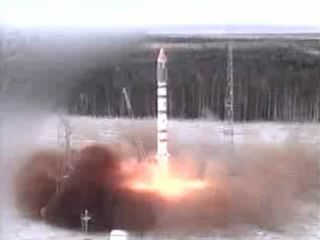 SSETI Express, a satellite designed and built by European university students, launched on 27 October 2005 at 2:52 EDT from the Plesetsk Cosmodrome on a Russian Cosmos 3M launcher. Astudent-built spacecraft rocketed into space alongside several othermicrosatellites early Thursday, riding a Russian booster skyward in a spacestaged from Plesetsk Cosmodrome. The boxy SSETIExpress satellite, built by more than 400 university students for theEuropean Space Agency (ESA), launched into space atop a 10-story Kosmos3M rocket at 2:52 a.m. EDT (0652 GMT). According toRussia's Interfax News Agency, the spacecraft and seven othermicrosatellites reached their intended orbit shortly afterward. "Thisimage that we have of the launcher on the pad, this is the image they had,"said Philippe Willekens, educationprojects administrator for the ESA, of SSETI Express' student builders beforethe successful launch. "They wanted to...launch thatdream, and it's finally paid off." StudentSpace Exploration Technology Initiative (SSETI) program, which is atencouraging student interest in space and engineering, while offering practicalexperience. Built fromdonated and student-built components, the 136-pound (62-kilogram) SSETI Expresssatellite is about the size of a small washing machine and is expected tophotograph the earth and serve as a radio transponder for amateur radiooperators. It also carried three 4-inch (10-centimeter) wide picosatellitesinto orbit, ESA officials said. Riding intoorbit with SSETI Express were Russia's Mozhayets-5satellite, as well as the Britain's TopSat, Iran's Sina-1, Norway's Ncube-2,Germany's UWE-1, Japan's XI-5 and China's DMC-4 - which is also known asBeijing-1. Delaysin the delivery of Sina-1 pushed today's space shot from its original Sept. 30launch date, Interfax said. China'sBeijing-1 spacecraft should generate an extremely detailed map of the country.The spacecraft was expected to form part of the international DisasterMonitoring Constellation (DMC) and carries the China Mapping Telescope to imagethe nation's topography, according to officials with the optics firm Sira,which built the telescope for the Britain's Surrey Satellite Technology Ltd(SSTL). Witha resolution of about four meters, the China Mapping Telescope is reportedlyabout eight times more powerful than past DMC satellites, and will be used formapping and disaster monitoring in preparation for Beijing Olympics, Siraofficials said. SSTL- which also constructed the TopSat spacecraft - provided the Beijing-1 for theBeijing Landview Mapping Information Technology Ltd, according to theirwebsite. Meanwhile,ESA officials hope that SSETI Express won't be their last student-builtproject. Plans are already underway for an Earth orbiter - the European SpaceEarth Orbiter (ESE0) and a Moon orbiter, and interest seems to be growing amongthe program's target audience. "Every year a dozen or so students ofour university join the project," Marcin Jagoda, who graduated from Poland'sWroclaw University of Technology in July where his team built SSETI Express'communications system, told SPACE.com before launch. "Currently [the]team is working on the communications system for the European Space Earth."